Alice and her sister are sitting under a tree when Alice sees a talking White Rabbit hurry down a rabbit hole. 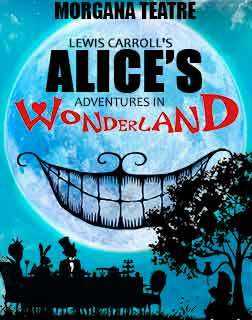 Alice decides to follow him and she finds herself in a dreamy and rather unusual place – Wonderland! She comes across a bottle that says “DRINK ME”, which she does and shrinks into a tiny version of herself. Then, she sees a jam tart that says “EAT ME” so that she grows to a towering height! This is the beginning of a whole host of strange happenings. Looking for the White Rabbit, she meets the Cheshire Cat, a playful feline who can appear and disappear at will, on whose advice she joins the Mad Hatter for a never-ending tea party. Yet, after the Mad Hatter tries to cut Alice’s hair, she runs away from the mad tea party and finds herself in a garden where she meets a furious Queen of Hearts.